Black Friday & Small Shop Saturday 2018 Wedding Stationery Deals!!! It’s that time of the year again!! I can’t believe its already the holiday season! This year has just flown by. We are so grateful that we have the opportunity to do what we love and to work with such amazing brides throughout the year! 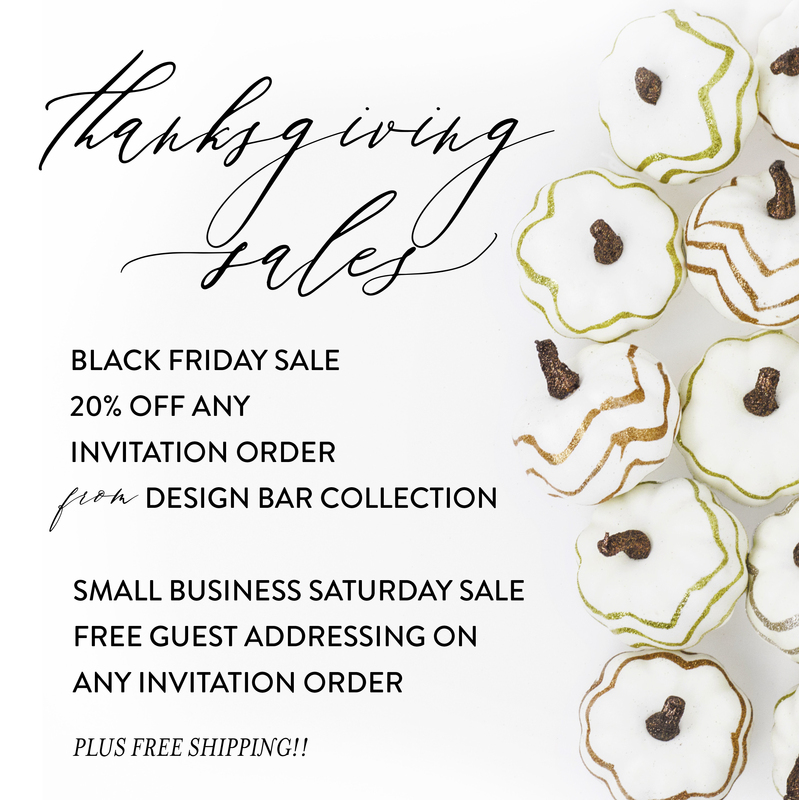 So in the spirit of giving, we are excited to roll out our annual Black Friday + Small Shop Saturday Wedding Stationery 2018 Sales for all brides looking for some great savings this holiday season!! Here are the details for our Black Friday and Small Shop Saturday holiday sale!! Check out our Design Bar Collection to view all of the designs. Each design can be fully personalized to fit your wedding style. Feel free to add on colored envelopes, envelope liners, switch fonts, change up ink colors, add in a custom illustration of your venue, add a wax seal or silk ribbon. The possibilities are endless on how you can make these designs work for your wedding style. If you aren’t sure how to do that, just ask. We are happy to walk you through this process and create a look that speaks directly to you and your event! This Sale is available ONLY on Friday, November 22nd. In order to secure the 20% off discount, the $100 deposit must be placed through our SHOP that day!! This sale is only valid for new customers. And, as an added bonus the sale includes FREE SHIPPING on all orders in the US. Free Guest Addressing on any invitation order. If you are looking for a custom invitation design, this deal might be perfect for you. Although brides who are interested in doing the Design Bar collection, the free addressing still applies! This deal is applied to Free Guest Addressing on the Outer & Inner Envelopes, return address and rsvp envelope address. This is a significant savings! In order to secure this deal, please place a $100 deposit on our SHOP the deal is valid ONLY ON Saturday, November 23rd. As an added bonus, we are giving away FREE SHIPPING for all US customers. This sale is valid only for new customers.